When we first meet Elena Ramos, she's linked to John Ross, both as a partner in striking oil on Southfork and in the bedroom. But then we learn that Elena, the daughter of the Ewings' longtime cook, also has a history with Christopher, whom she almost married. As such, Elena is a woman torn between two men. 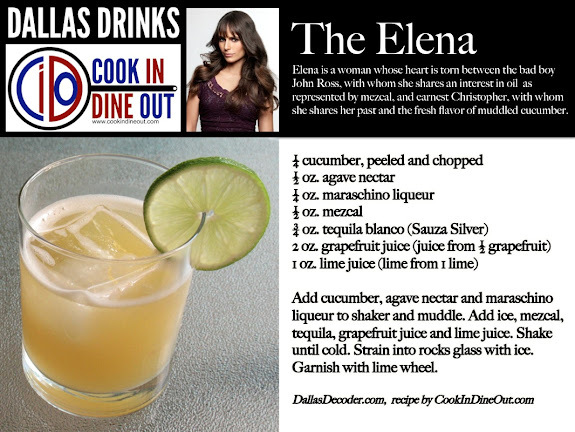 The Elena cocktail nods to her Mexican heritage as well as her connection with John Ross and Christopher, featuring common flavors with The John Ross (mezcal and lime) and The Christopher (muddled cucumber). This is a good one. Thanks for making it dear.